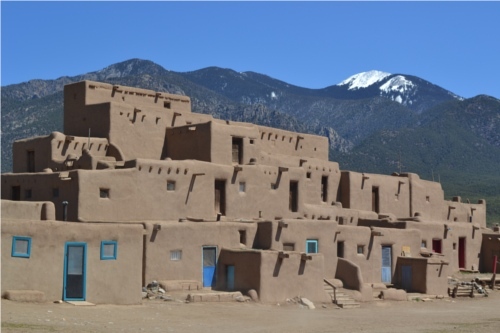 A visit to Taos Pueblo is one of those quintessential New Mexico experiences that every traveler and local must have. Constructed between 1000 and 1450 A.D., it is one of the most significant cultural and historical landmarks in the world. Taos Pueblo is a veritable 1000-year-old history book that remains almost as untouched by modernization today as it was in 1540, when the Spanish came upon the village and believed it to be one of the “Seven Cities of Gold.” Still without electricity or plumbing within its walls, the ancient village rises out of the earth and sits proudly afoot the sentry of Taos Mountain. Eliciting all the nostalgia of a time long past, this tiered structure is called Hlauuma in the Native Tiwa language, meaning North House. There is also the Hlaukwima, or South House, across the river. These are said to be the oldest inhabited communities in the U.S. The Pueblo is painstakingly maintained by its residents. The Tribal Council ensures the inhabited structures’ mud exteriors are repaired and refreshed each September to shore up against the onset of winter. 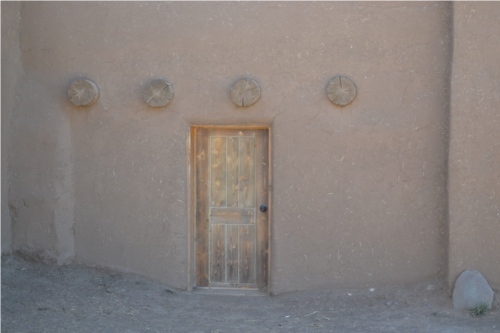 The flecks of straw in the adobe plaster show that no modern shortcuts have been used in this process. A tiny house sits abandoned on the south side. And although it lacks its new coat, it has a picturesque appeal that tells its own story — both inside and out. 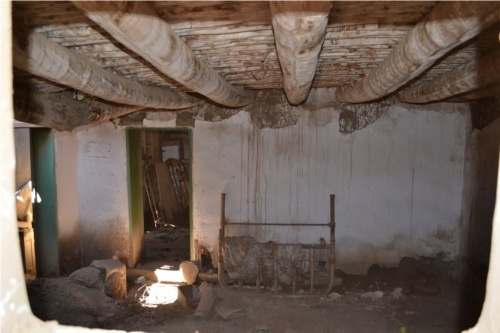 The ancient bowing beams show the stress from hundreds of years under a heavy dirt roof. 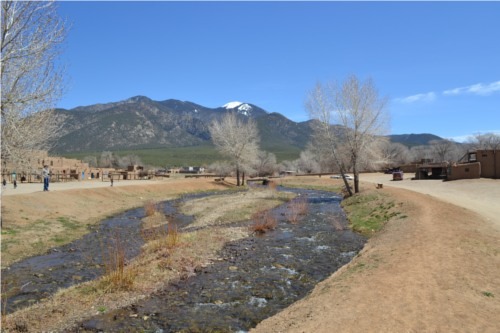 The artery of the Rio Pueblo de Taos flows alongside the main plaza where traditional ceremonies are held. To this day, the river is the main source of drinking water for the Pueblo. About 150 people reside in the Pueblo full time. Others have homes outside the historic village perimeter, but on the reservation land. The reservation covers 99,000 acres. Within the village there is little, if any, sign of modernization. The residents remain loyal to their duties that maintain tradition, but they have to work hard to balance their traditional lifestyles with the demands of modern existence, which for many, includes achieving a college education. An important element for the Pueblo economy is tourism and the sale of Native arts and crafts. 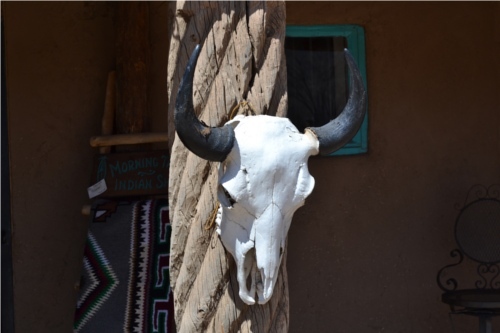 Although there isn’t an abundance of curio shops, you can find mica-flecked pottery, silver jewelry, moccasins, boots, drums, art and weavings. The curio shops are individually owned, as are the few food shops that offer traditional dishes and snacks. And today, the comforting smell of fry bread smoke rises from a few of the horno ovens. 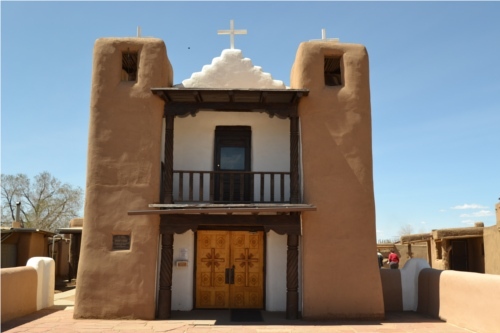 The original San Geronimo (Saint Jerome) church was built in 1619. 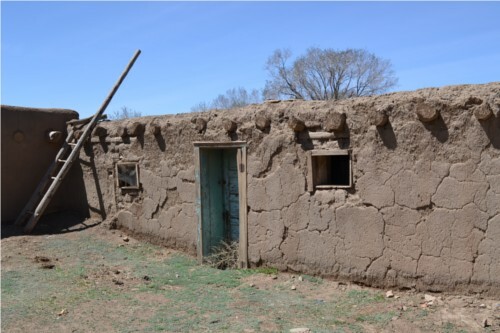 After being destroyed during the Pueblo Revolt of 1680, it was rebuilt. In 1847 it became a victim of the war between the U.S Army and Mexico. 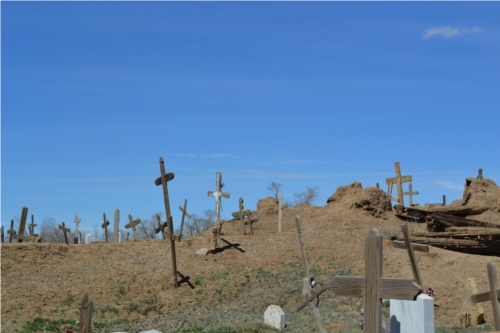 Now only its bell tower and the dancing crosses of its graveyard remain. In 1850 the San Geronimo Chapel was completed. It sits facing the main plaza and looks almost new with its fresh paint and carefully tended walls, windows and doors. 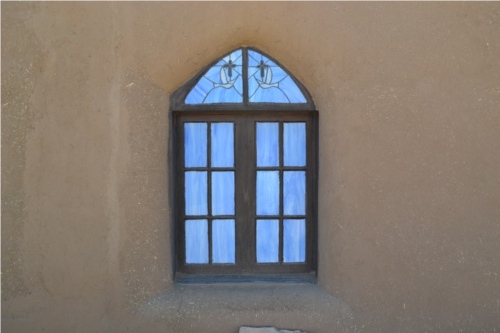 Its row of blue windows greets visitors as they first enter the Pueblo by the main street. 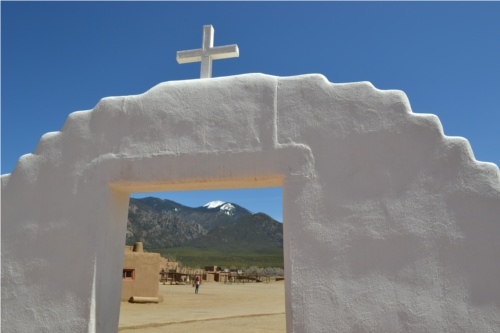 The view of Taos Mountain is framed by the courtyard entrance. The ancient and complex Tiwa (sometimes spelled Tewa) traditions and Catholic rites exist harmoniously within the lives of the Pueblo people. This symbiosis is also apparent in the mix of annual ceremonials and Feast Days. Note: No photography is permitted during the ceremonies and Feast Days. 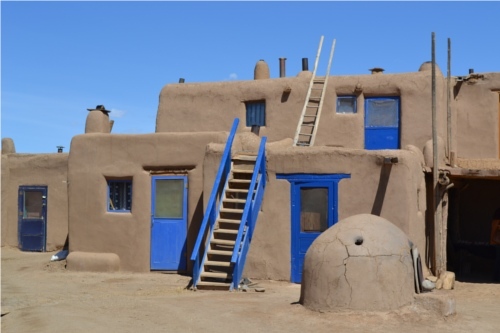 I have seen many beautiful photographs of Taos Pueblo — all rendered its mystery and a sense of familiarity with the tiered shapes and brightly colored doors and accents. But until I had actually been there and walked its streets, I could never have said I’d seen it. Taos Pueblo is an experience, a captured time, an irreplaceable wonder; something there are so few of these days. This entry was posted in All Posts, Day Trips, Helpful Tips, Museums, Special Events, Things To Do by Maria Johnson. Bookmark the permalink. 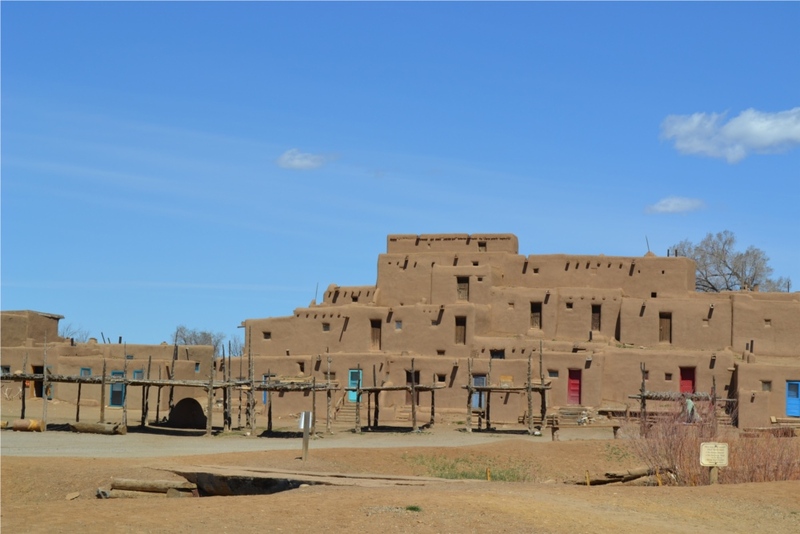 Maria, your comments and photographs of Taos Pueblo are right on! I did send an email thanking you for the article. 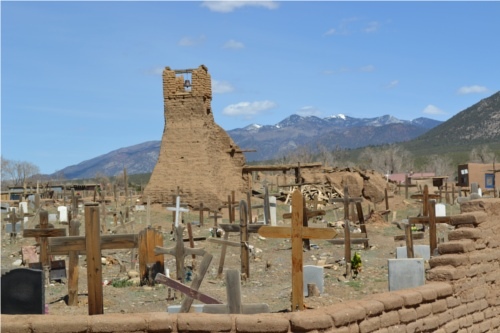 As I stated in the email, those of us who know and respect the Taos Pueblo and its people, each time I read about the pueblo and its history, I’m struck by its beauty and mystery. How lucky we are to live so close to this remarkable place and its inhabitants! Looking to Taos’ wonders on my upcoming trip!! !